For almost thirty years Rod and I have tended to the animals with only a few hiccups in care along the way. A day here and a day there have required help from friends who will stop in to feed horses, to check on the homestead or to rescue animals from a thunderstorm in our temporary absence. 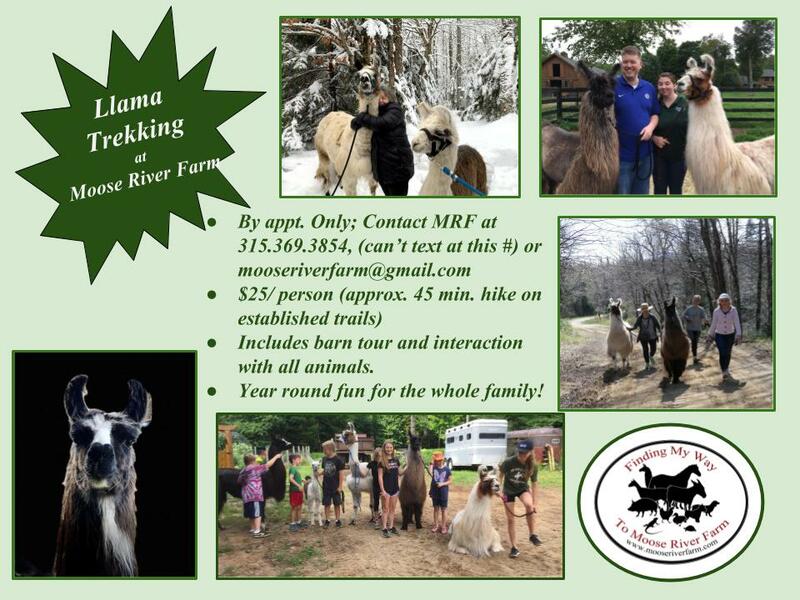 Vacations require another family to literally move into our house so that the smooth routine can continue at Moose River Farm. Somehow it all works and I am more and more grateful for this incredible privilege to live with so many animals. In August, however, a nagging symptom in Rod's arthritic spine led him to an orthopedic surgeon who confirmed what we already suspected. Scoliosis, spinal stenosis and arthritis were crippling Rod. Major back surgery was the only option to prevent further deterioration and to alleviate chronic pain. Scheduling the operation had to wait several weeks as Rod was already preparing to undergo surgery for a hernia. With medical repairs on the horizon, Rod and I were forced to divert our attention from the daily caring of our animals. This was a necessity. Albeit difficult to do, I needn't have worried. Surrounding me at all times is a group of people who can step in and take over without missing a single detail in the barn. Animal routines continued without interruption and I was able to completely concentrate on Rod. 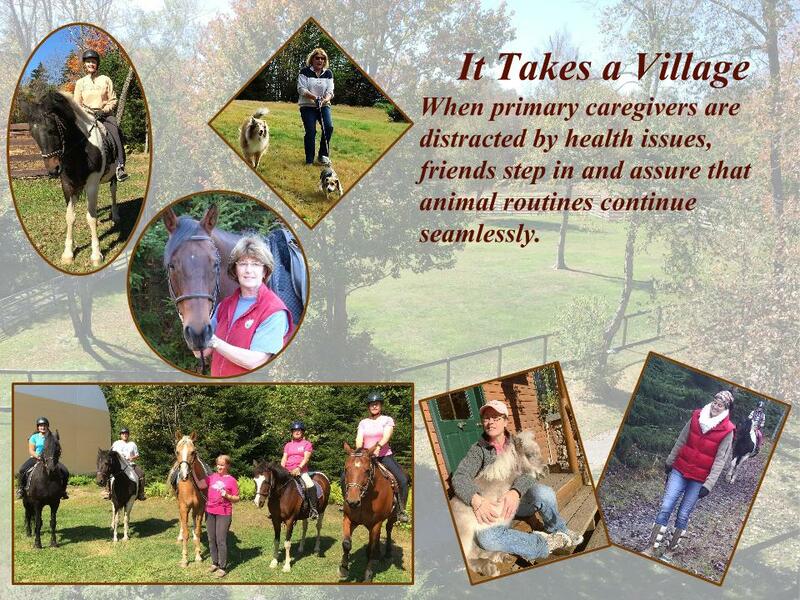 "Jean and I are going to come at noon and Vicky will be here late in the afternoon to feed horses dinner. Don't worry about anything here," my friend Michele, (Friends and Blessings) affirmed. After a long day in the hospital and an hour drive both ways, we arrived home where Rod could spend a number of weeks recuperating. The first several days were rough. Managing pain while Rod's body desperately purged the anesthesia made me reluctant to leave him for an extended length of time. My focus remained in the house. Not to worry, the barn purred along under the care of Jean, Michele, Irene and Vicky. Horses were turned out, stalls cleaned, water buckets filled, and dogs walked, whether I was available to help or not. After the first week, Rod began to recover quickly; almost too quickly resuming chores around the farm that had waited impatiently for his return. Our caregivers were quick to reprimand him. "Should you be doing that so soon?" inquired Jean, gently when Rod began raking in front of the barn one day less than two weeks after his surgery. "I have to do something," he replied indicating a sense of boredom waiting around inside the house for his incision to heal. All things considered, healing from the initial surgery was simple compared to what was to come. Back surgery was scheduled for the middle of October which meant that I would be teaching school; requiring extended days off to take care of my husband. Although Jean and Michele were headed south within days after the surgery they had arranged to step in once again and take over the animal care. Vicky, Irene and another friend, Lynn had cleared the days on their calendars to help. Once plans were meticulously arranged and everybody confirmed in their designated roles I could finally direct my attention to Rod's needs during what was certain to be a long convalescence. Then the hospital called to reschedule! The new date threw us all into a tailspin. It was after Michele's and Jean's departure dates. Irene's availability decreased due to work. In the end Vicky, (Special Needs I and Special Needs II), stepped up to take over the farm duties. Rod's surgery took eight long hours to realign, readjust and stabilize his spine. Dr. Anthony Lapinski was confident that by taking his time and addressing three separate procedures at one time, Rod would receive a favorable outcome. During the long wait, Vicky came to the hospital to distract me. In the late afternoon she made her way back to the farm to tend 11 horses, 3 dogs, 2 donkeys, 2 goats, 9 chickens and a pig. By the time I arrived home, weary and spent, she was preparing a late dinner for me. Afterwards we tended to evening barn chores. I basked in the presence of my horses, precious rejuvenating beacons at the end of a long and worrisome day. Over the next three days I was able to teach school and head to the hospital to visit with Rod. Once again the anesthesia was wreaking havoc on his debilitated body making it impossible for him to eat. I was thankful for trained nurses around the clock to assist him through this necessary evil of post- surgery. At home Vicky, accompanied by Irene during the day, kept my animals in the calm of their established routines. It was most comforting to me while feeling fractured from their care at the moment. Evening and morning chores were the only times that I made contact with them. Thank you John and Pam Leach, Lynn Durkin and Jennifer Basile for animal care during Rod's recovery. We are so grateful. Vicky, (holding her baby Scout), resided at MRF caring for animals so that I could be with Rod in the hospital. ...who love the horses as much as I do. 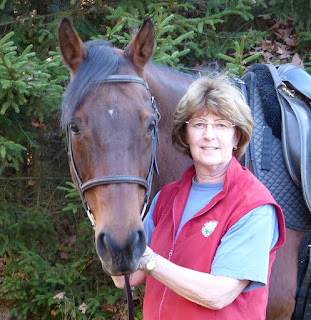 My friend Irene, (who boards her horse, Ben, at MRF) frequently cares for the horses in the middle of the day. She calls it her workout! 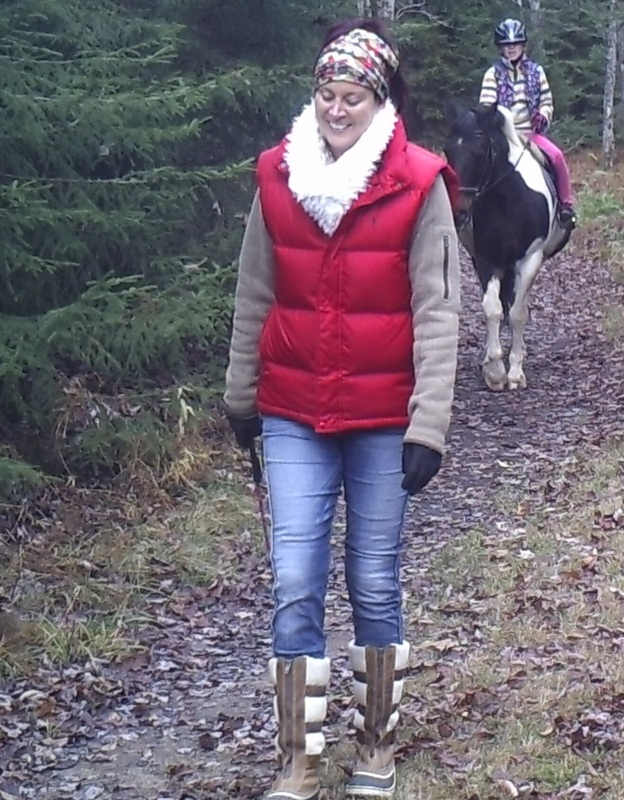 A new horsey resident to our area, Jennifer was available to help with the horses mid-day once I returned to my job. ....and Michele have stepped in to care for the animals countless times over the last twenty-five years. 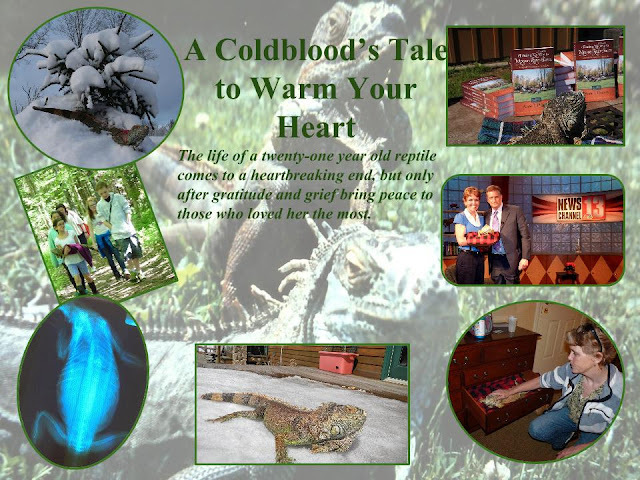 Last weekend I posted Part I of an excerpt from my second book, due for publication next summer. The story was the account of the final days of our iguana, Rosemary, after a devastating diagnosis. In Part II, acceptance of her imminent loss comes with the realization that all is as it is meant to be. "Judging from her condition and the size of the mass, we are probably talking about a matter of weeks. She looks comfortable and as long as she is eating and able to relieve herself, she should be okay. As soon as you notice her straining to go to the bathroom, then it will be time." "I am so sorry," said Dr. Roach as Vicky and I gathered our belongings to leave. In the reception area I waited in emotional agony to pay the bill. Rosemary's appointment had consisted of an ultrasound and an x-ray to confirm the fatal prognosis; money well spent. “I just need a minute,” I said to Vicky as we approached the parking lot. Once seated inside the car I allowed myself to release the pain that was welling up from my gut. Tears gushed out of me as a wave of intense sadness purged forth. In its wake was the sobering realization that Rosemary’s and my twenty years together were swiftly coming to an end. As the ardent feelings calmed, it occurred to me that my prayers had actually been answered. Six months prior to this terminal diagnosis, I feared that I had already lost her in a most dreadful way. In April my lack of vigilance almost killed Rosemary. I pleaded and prayed for her life. She and I had come too far for the end of her story to include such a sad demise. My friends Missy and Mary Anne were visiting me at the time during spring break. 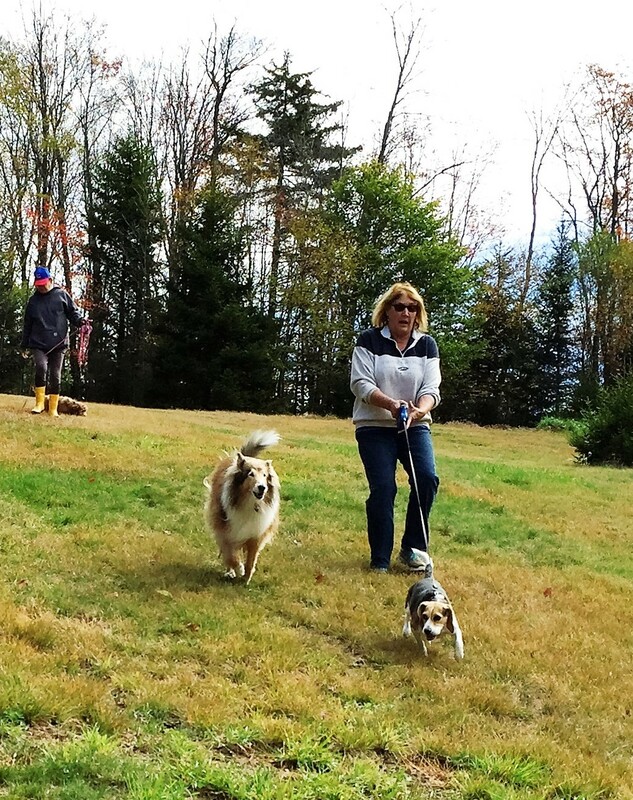 We had spent an eighty degree day in sunshine that tricked the Adirondacks into believing the coldest, most extreme winter of the century was behind us. Rosemary laid on the deck most of the day soaking up much needed unfiltered sunlight. That evening I presented a book talk with Rosemary at the Canastota Public Library. All was well. The next morning it appeared that winter had returned to humble us once more. Brutal wind and drizzle turned into blowing snow by early afternoon. The last time I had taken notice of Rosemary she was strutting across the kitchen floor in the late morning. Distracted by my visiting company, I didn’t even think about her again until evening. Our dinner was warming in the oven and my guests and I were enjoying a glass of wine. I chopped zucchini and grapes into bite sized pieces, then went to locate the iguana on her heating pad in the living room to feed her. She wasn’t there. I searched several other locations around the house where she frequently napped. When my search came up empty again, a bolt of fear shot through my limbs. By now Missy, Mary Anne and Rod were also engaged in the search around the house. My brain whipped lightning fast through the following scenario. Rosemary had just spent a summer day outdoors. She had convinced herself that good weather still existed on the other side of the dog door which she had learned to exit. I dashed out the door, leaped down the steps and sprinted around the deck preparing myself for what I knew I was going to see. Under three inches of snow I found her lying by the dormant remains of her favorite yarrow plant. I grabbed the lifeless body and scrambled back into the house. My shrieks brought Missy and Mary Anne running into the laundry room as I hastily filled the utility sink with warm water. Only one word describes how Rosemary looked; dead. She was the color of gray storm clouds announcing pending doom. Her mouth slacked open while the rest of her body hung limp. In disbelief I stared at her lying motionless in the water. How had I let it happen? “This is not the way it is supposed to end,” I sobbed. Mary Anne, Missy and I began rubbing her extremities and her torso under the warm water. She did not appear to be breathing which raised the level of anguish even more. In my despair I became aware of Rod pacing back and forth behind us, craning his head every once in awhile to observe progress. “She’s gone, Anne. She’s gone. There is no use,” he admonished quietly. Those words twisted in me like a dagger resulting in uncontrollable sobs. Neither Mary Anne nor Missy turned to console me. Their hands were too busy massaging Rosemary’s limbs and keeping her head above water. For an agonizingly long time we focused on Rosemary. My sniffling sobs were the only sounds in the room. As time marched on I feared that Rod was right. The iguana’s body remained flaccid. Her eyes stared blankly from either side of her head through droopy lids. From time to time Missy stopped massaging to pinch Rosemary’s toes. When no response resulted she dutifully took to massaging again, never once indicating it was time to give up. My guests could only soothe me with words. Their hands refused to stop. For another twenty-five minutes we rubbed Rosemary’s body in the warm water. In the back of my mind I remembered watching a piece on the news years ago. Florida was experiencing severe cold that threatened citrus groves and other temperature sensitive crops in the southern part of the state. Feral iguanas, abandoned in the wilderness by pet owners, were falling out of trees. Although they appeared dead, they began to thaw once tossed into the warm interior of a municipal pickup truck sent out to collect them. Eventually, the truck swarmed with energetic iguanas who returned from the frozen brink none the worse for wear. The image of the revived iguanas replaced doom, as I continued to will Rosie back to life in the sink. 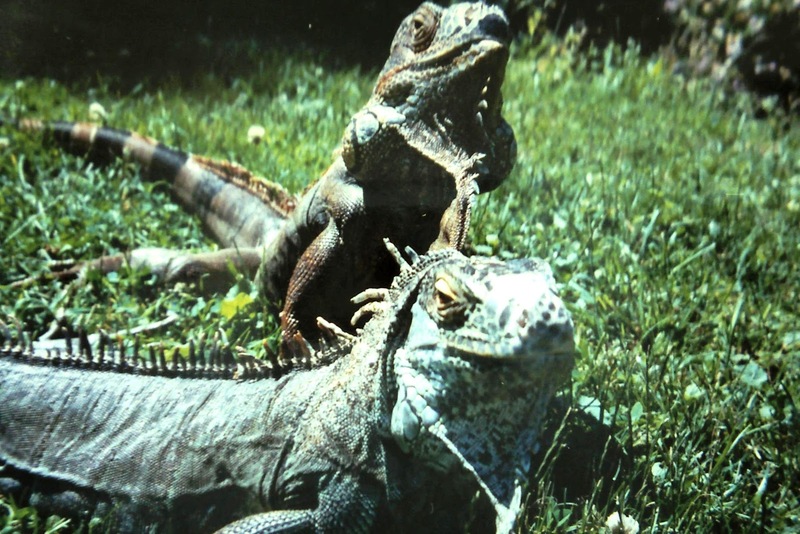 Iguanas can survive temperatures in the low forties and upper thirties, (Fahrenheit). When I found Rosemary the air temperature was twenty-six degrees. We estimated that she had been outside for over six hours. In the end it may have been the three inches of insulating snow that saved her life by keeping her tissues from dropping below freezing. At that point her organs would have been frozen, destroying the delicate cellular structures that composed them. After forty-five minutes, Missy received minimal reaction from pinching a toe. Rosemary contracted her leg ever so slightly in response. Slowly but surely, she started to revive. Eventually, her eyes focused and the eyelids widened into full consciousness. We continued our vigil at the sink, for the core of Rosemary’s torso was slower to warm-up. Finally, when the lizard was able to swim in the water on her own, we deemed it safe to remove her from the sink. I stuffed her under my shirt, securing her between my wool sweater and warm skin while I assembled dinner plates with overcooked leftovers. At the table we clinked our glasses in a toast to Rosemary’s immortality and to happy endings. With the crisis behind us we nicknamed her Frozemary. I kept kissing the nose protruding above my turtleneck and affirmed appreciation over and over for the chance to write a different ending to the iguana’s story. Rosemary’s final diagnosis, the one that would ultimately claim her life was out of my control. The quiet moments after my emotional release in the car, allowed me to accept just that. Death on the night of the deep freeze, would not have given me a chance to spend quality time with her before saying goodbye. At home I soaked her in the same life-saving sink everyday so that she could relieve herself comfortably. I fed her kale, snap peas, peppers, grapes and scrambled eggs by hand. She spent much of her time on her heating pad by the living room window. When it got too warm there she was free to move away onto a dog bed or underneath the cabinet that supported our TV. On sunny days we laid her out on the deck. As if a plan greater than we can know was in place, our petunia plants, for the first time ever, survived for several more months once they were moved indoors. Mood-lifting pink and purple flowers continued to blossom through late fall, much to Rosemary’s gastric delight. The week before Christmas it became evident that Rosemary was ready to die. She refused to eat; spitting out any food that I forced into her mouth. Her wonderful disposition never changed which made the decision difficult. I always look for some profound change in behavior or temperament. With Rosemary it never appeared. The appointment was made and two days before Christmas on an unseasonably warm reptile-loving day, Vicky agreed to accompany me, yet again, to Canastota for Rosemary’s final visit. In the morning of the last day, I was scheduled for a therapeutic massage. After years of middle-age physical discomfort and only temporary relief from prescription medication, I decided to try a holistic approach to self-maintenance. Rod had given me two sessions for Christmas the year before and after finally redeeming them eight months later with favorable results, I was hooked. I climbed between the pre-warmed flannel sheets on the massage table and lay on my stomach, face down against the headrest. Air forced out of my lungs encouraged my body to relax in the bed. At low volume, Enya performed in that mesmerizing pitch that defines new age music. Suzy Stripp entered the room and pulled the sheets up to my neck. She laid her hands on the right side of my spine and began to push gently into my back. Her deliberate heavy breaths in and out were a signal for me to do the same. I complied in deep inhalations and then we parted company. On this particular morning my head was full. It took some time to chase away the chatter that had accumulated. Eventually, Suzy’s hands created a flow of energy that cleansed the debris from my mind. I allowed thoughts to meander in a linear formation. Anything was possible. Into Rosemary’s body I crawled. It was she who was lying on the table under Suzy’s hands. I could imagine Suzy carefully massaging the protruding ribs and hip bones. It forced me to see my lizard’s deteriorating condition. I crawled in deeper and tried to scrape the killing mass out of her belly. There was only one heartbreaking truth of my day. In just a few hours, Rosemary would be gone. The loss was going to cut deep and take time to heal. Tears dripped off of my nose and splashed onto my hands. Although I knew Suzy would understand, I didn’t want her to know. I needed her to continue manipulating my shell; opening spaces for the sadness to drain. When Suzy expertly located a sensitive pressure point, the searing pain aligned with my loss and jolted my thoughts. I exited the lizard. Next, I was sitting with Rosemary on my lap. Several children were reaching out to touch her. They bombarded me with questions. The answers poured out like a recording. I had answered them hundreds of times over the last twenty years. I was Rosie’s interpreter. All she had to do was sit in my lap and just be. Switching thoughts again, I was reminded that the next day life at Moose River Farm would go on as usual. Rosemary would be gone but horses, dogs, donkeys and everybody else who resided there would still require my attention, my care and my affection. I would know when Rod was preparing the burial site. I would know when Rod had removed the body from my car. And I would know when he had placed her into the hole that had been dug in her honor. Later that day Dr. Roach handled us with the utmost compassion. I held Rosemary. This time my hands would not revive her after she inhaled the anesthetic gas. My eyes stared up at the ceiling for I could not bear to watch the needle puncture her heart. I am forever grateful to Dr. Roach for providing the end of this beautiful creature’s life. The next day Rod buried Rosemary’s body in the corner of our backyard where she had spent many a summer day basking in the sunshine. It's comforting to know she is tucked below the earth in eternal slumber while we continue with the process of living above ground. In the days that followed, Rod searched the internet for an appropriate memorial to immortalize twenty-one years of a special reptilian life. Now, this concrete iguana with the familiar Mona Lisa smile watches over Rosemary as she rests in glorious peace. About a year ago we said goodbye to one of the longest lived members of our menagerie. Rosemary the iguana arrived as a juvenile in my classroom more than twenty years ago and lived out the rest of her life under my care. 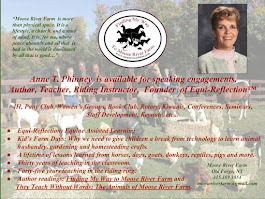 The story of her early years, (Animals in the Classroom), can be found in my first book; Finding My Way to Moose River Farm. This excerpt is from my next book that will hopefully, be ready for publication next summer. The diagnosis was a shock, although I had expected something was different for some time. What is difficult with animals is that as long as they are eating and excreting fairly normally it is easy to deny that anything other than old-age is afflicting them. Rosemary had survived a long cold winter in the house that we struggled to keep above seventy degrees. Many mornings I found her stiff and ice-cold on the living room floor after having chosen to evacuate a cozy heating pad under the footstool. The bitter cold had arrived early: mid-November, and had lingered long into May, later than any year I could remember. Rosemary ate well but only if I hand fed her. On sunny afternoons she sought warmth from sunbeams that beckoned through the long windows in the deck doors. Occasionally, I placed her out on the back doorstep where she benefitted from a dose of unfiltered Vitamin D therapy. It also enabled the parietal eye on top of her head to determine what time of year it was. A lizard’s body fat and condition are observed at the base of its tail. As long as the animal is eating sufficiently, the tail remains plump with taut skin completely concealing the skeletal frame. Rosemary’s pelvic bones began to make an appearance at the end of the harsh winter. At first I talked myself into believing her age was at fault. I had been feeding her regularly. But why wasn’t her tail fat? By late summer it was hard to ignore the signs. First, she developed excessive thirst, plunging her snout into any potential water source, ie. her bath water or puddles on the outside deck. Reluctantly, I began to explore the internet. My heart sank. Renal failure, retained egg follicles, liver disease, and a plethora of lethal horrors kept me awake at night contemplating what to do. I worried incessantly about her. What was I missing? Why couldn’t I figure it out, apply the necessary treatment, and move forward into the next 21 healthy years of Rosemary’s life? Eventually, my keyword search transitioned from iguana ailments to reptile veterinarians in central New York. Our regular veterinary clinic handled all of our animals except reptiles. For this, I was referred to an animal hospital over two hours away near Watertown, New York. My own search located a clinic much closer in Canastota, home of The International Boxing Hall of Fame. Once the appointment was made there was nothing left to do but wait for the moment of truth to arrive. “Let me get my book and show you what a normal iguana’s body looks like first,” said Dr. Barbara Roach as she stepped out the door of the examining room, to retrieve a veterinary textbook on reptiles. “This can’t be good if I have to compare Rosemary to a normal iguana,” I muttered. My friend Vicky had accompanied me on the trip and into the examining room. Her lack of reply convinced me she agreed. The image on Rosemary’s x-ray was as clear as the realization that my iguana was probably not going to live much longer. In comparison, Rosemary’s lower abdomen was full of a large opaque mass that was absent at the dorsal end of the torso in the normal image. This evidence proved that I could no longer blame Rosemary’s symptoms on natural aging. Awakened from denial, I listened sadly, as Dr. Roach professionally continued her diagnosis. My broken heart caught the emphasis on tumor, kidney failure, fluid in the abdomen, weight loss, deteriorating condition, forcing me to see the iguana for the first time as terminally ill. Under the weight of the prognosis, my emotions crumbled. Rosemary lived in my house longer than any other animal we have ever owned. Only one horse, Windy, who lived in our barn for twenty-four years until his euthanasia at age twenty-seven, had been a part of our family longer. Rosie had belonged to a child who named her baby lizard in honor of a grandmother. When the child needed to find a home for the iguana a year later, she asked me if Rosemary could live in my classroom. I agreed, hopeful that Rosie might provide companionship for our two year old male iguana, Spike. She did. 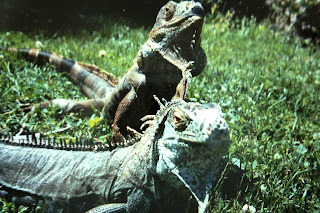 For almost a decade the two iguanas co-habitated. For six of those years they took up residence in my sixth grade classroom. Along with rats, hedgehogs and a veiled chameleon they helped me teach valuable lessons of compassion beyond algebra, grammar and the rise of democracy. Six years of positive interactions with children swiftly transitioned into concern and allegations when a new superintendent came on board at our local public school. Rosemary, Spike and all of the other animal co-teachers that made learning and teaching in the classroom more stimulating were evicted. Rosemary and Spike returned to my home and lived a quiet existence until Spike passed away eight years later. After Spike died I wondered how much longer Rosemary might last. She did not miss him. They had been physically separated when it was made perfectly clear that she was not interested in his amorous trysts. Yet, her life continued in good health through cold winters, hot summers and other seasonal fluctuations in which tropical species should find it difficult to thrive. 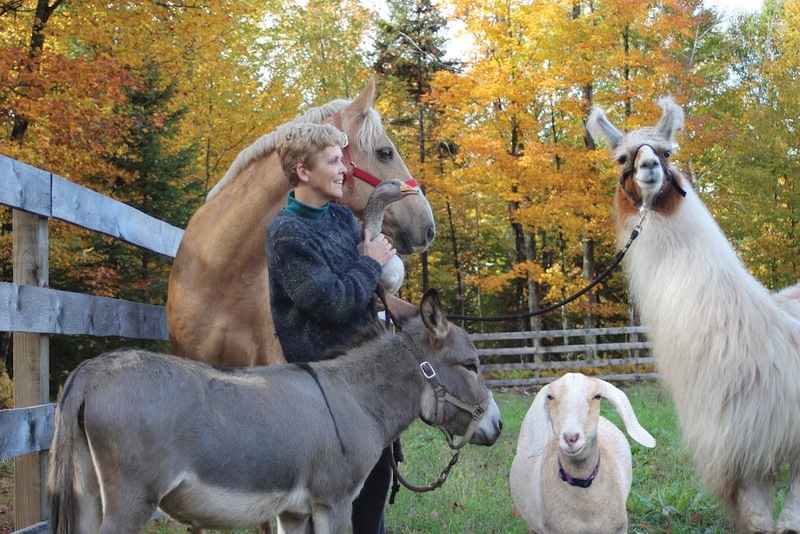 Her beguiling personality and faint smile made her a hit among most visitors at Moose River Farm. Two friends of mine, Sherry Grimm and Star Livingstone always asked after Rosemary and took advantage of every chance they got to spend time in her company. The iguana continued to entertain so many who oohed and aahed as she grazed on the lawn or plucked her favorite petunias buds from my planters. Children clamored to deck chairs and sat patiently while Rosie was laid in a towel across their laps. The iguana posed for hundreds of pictures. Most recently, she had been included in many “selfies”. Rarely did an encounter with Rosemary result in anything less than appreciation. When my book became published I combed the internet for opportunities to promote it to animal loving readers. The book market is competitive with so many genre available and accessible. Attracting attention to one’s own title requires careful planning and creativity. 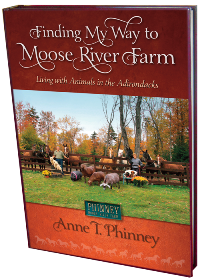 At the Moose River Farm book launch I witnessed first hand the power that my animals had over would-be readers as they engaged with each other. After all, the book is about animals; the joys and sorrows they bring to my life and the lessons, (oh so many lessons), that they teach everyday through their pure honesty. My experiences with animals are not unique. Perhaps most animal lovers have not had the number of interactions with different species that I have but if they have ever loved a dog, a cat, a hamster, or a deer who frequently visits their backyard then they will connect with the stories I share. Rosemary was no exception. She spent that first book signing event sprawled out on a table keeping an eye on activity all around the farm. Her presence gave me confidence to speak to people, engage them in conversation about their own animals and encourage them to scratch behind her ears...once they identified where her ears were. In the same way, my first horse, Promise had helped me build confidence during those awkward ugly teenage years so many decades ago. Together, Rosemary and I became a marketing team. Taking her with me on book signings was not only a sure way to attract potential readers but it also provided us with quality time to spend together away from home. For hours I sat with her in my arms as hand after hand reached out to make her acquaintance. When my publicist, Susan Schwartzman, arranged television interviews in Louisville, Kentucky, Rosemary did not attend. Rod and I combined the trip with a mini-vacation in the Bluegrass horse country. Since we traveled for several days, it was necessary to leave the iguana safe at home under the watchful eye of our phenomenal house-sitter, Robyn Craig and her family. Without Rosemary I felt a bit out of my comfort zone. She was a wonderful diversion from the camera as she lounged in the TV host’s lap. I managed to survive the interviews without her but couldn’t help feeling that all would have proceeded more effectively with her presence. 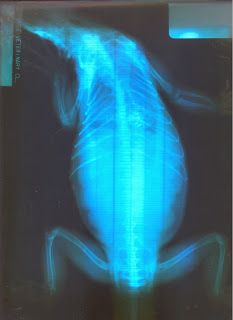 This x-ray diagnosed the presence of more than 60 eggs.